I use my knowledge of psychology, anthropology and management science to assist organisations to manage human performance, usually in work contexts where risks are extreme and reliability must be maintained. I do this through the design of training approaches, technology, policies and procedures and data analytics. I make theoretical contributions in areas such as human decision-making, cognition and organisational culture. Before joining UTAS Ben was a Project Director for Occupational Health and Safety in the Human Factors Group – a part of Centre for Sleep Research at the University of South Australia. He has held professional safety management positions in state government and was a consultant occupational hygienist for approximately 7 years. He was the inaugural Peter Vulcan scholar at the Monash University Accident Research Centre between 2001-2005. Organizational and Safety Culture research; Emergency management human factors research; Human decision-making in high-risk work environments; Technology-based education in high risk work environments; Disruptive innovation in high risk work environments; Disruptive technology for safety management systems. 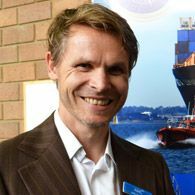 I am a Research Academic with strong long term relationships with industry in a number of areas – ports, shipping companies, critical infrastructure, major industrials and public emergency management organisations. For the past seven years I’ve held a centrally funded research fellow position at the Australian Maritime College in the University of Tasmania. In this time I’ve generated over $2.6 million in industrial research projects including projects with the ARC, with CRCs and across the full spectrum of research funding categories. The overarching goal of the Bangladesh Urban Resilience Project is to create a professional emergency management training track across various levels of government in Bangladesh. Phase 1 of this research contributes to the establishment of a National Disaster Management Research and Training Institute. This project involves an evaluation of leading research related to the proposed training tracks to identify best evidence-based practice that will be incorporated into the curriculum. The project will also develop a monitoring framework, including performance indicators to monitor and evaluate the progress, and effects of the program. The goal of this project is to provide outputs that facilitate enhanced decision making and team monitoring at strategic levels of emergency management. As part of this project we will examine how organisations currently learn from evidence and implement changes in practice to inform the testing and evaluation phases. Part of this work will be identifying opportunities and barriers to adoption of these tools and providing strategies that agencies can use to overcome these barriers. In this way we will contribute to enhancing the capability of agencies to effectively respond to emergencies now and into the future. This project is a short literature review and presentation that explores/surveys the status of the emerging maritime technology areas relevant to human factors for naval platforms in the current year (2017) and projections of potential application in zero-five (2017-22) , five-ten (2022-27) and ten-twenty (2027-37) years' time. The advantages, disadvantages and challenges associated with the applications, including an indication of how speculative the technology is will be included for each timeframe discussed. Improving Productivity, Occupational Health and Safety and Port Operations. The objectives of the project are to develop practical cognitive decision tools and heuristics that can be used in different emergency contexts to enhance strategic level decision making in complex, time-critical, multi-team situations. This will include constructing straightforward ways for strategic level managers to track the performance of teams they are responsible for to ensure the team is not operating at the edges of safety. To create these cognitive decision tools and heuristics the project will work closely with different Agencies to evaluate their current activities in this area. In addition, it will develop a set of process-based measures for Agencies to measure operational performance. The outcomes of the project are therefore: cognitive decision-making tools, particularly practical cognitive decision tools that can help people at strategic levels of emergency management to better deal with complex, time-pressured and multi-team situations; monitoring and tracking tools and strategies, such as tools to provide a way for strategic level supervisors to monitor the performance of individuals and teams; metrics for evaluation, particularly process-based performance metrics that allow independent evaluators to assess real-time performance. The aim of this research project is to select and develop a number of significant human performance measures especially attuned to a systemic view of maritime teams to use in the validation of studies such as fatigue, workload, situation awareness and user-centred design. These measures will be used to ascertain the effectiveness of interventions or suggested solutions such as e-navigation and ensure that aspects such as display design, control layout, input devices and communication methods are given appropriate attention. The measures developed can also be used in the evaluation of learning assessment. This project is an investigation into the development of a basic concept for the principal design of enhanced integrated Human-Machine-Interfaces to support green ship operation. It is a basic study into the application of a Human-Machine-Interface to assist bridge team in decision making for energy-efficient ship operation. It aims to prepare and draft teaching material for one simulation-based training exercise on energy-efficient ship operation. I supervise research degrees in the areas of speciality indicated by my research profile. Because the research I supervise is applied science, I build a team around the candidate to facilitate the utilisation of the research from the commencement through to the completion of the thesis.